I spent last week at the Mecca for romance writers, RWA’s National Conference, which took place in Atlanta this year. I listened to inspiring, educational, and sometimes heart wrenching speeches by the likes of Nora Roberts, Susan Elizabeth Phillips, Courtney Milan, Cathy Maxwell, and Kristan Higgins. 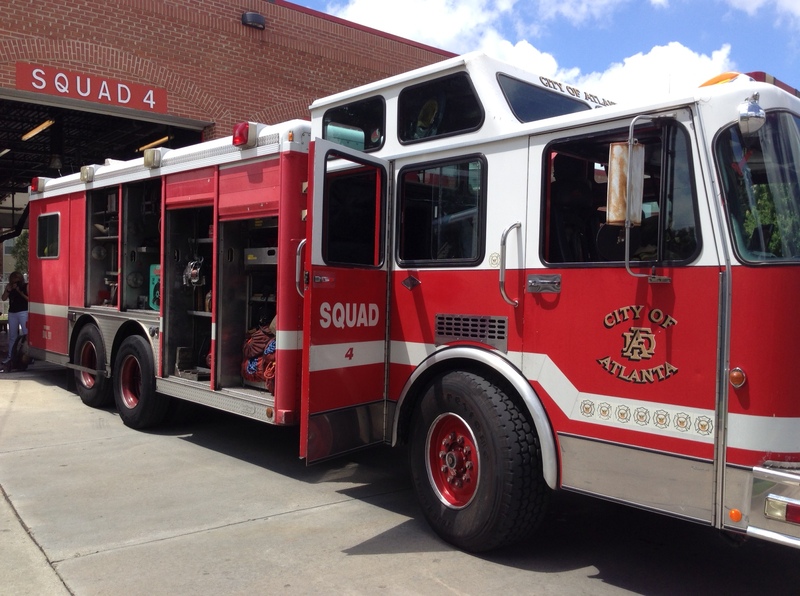 On my annual tour with the Kiss of Death (KOD) chapter–for writers of romantic mystery and suspense–the Atlanta firefighters shared their lifestyle, equipment, and stories. And, for the fourth year in a row, I made a new friend. The KOD tour is always worth every penny. At the conference, I learned about self-publishing from best sellers Bella Andre, Barbara Freethy, and Gerri Russell. A former green beret provided information about weapons, training, operations, and jargon. A cop-turned-writer shared undercover procedures and interesting stories from her time working narcotics for the Los Angeles sheriff’s department. Plus there were the craft sessions. Characterization, hooks, suspense, plotting, and more. On Saturday morning, I even gave my own workshop on creating e-books with Scrivener. There’s nothing quite like a whole week of rubbing shoulders with successful and aspiring authors, rekindling old relationships, and making new friends. An entire week surrounded by people who “get” me. Those who understand that particular brand of crazy that makes us writers. That’s why I go to conference. 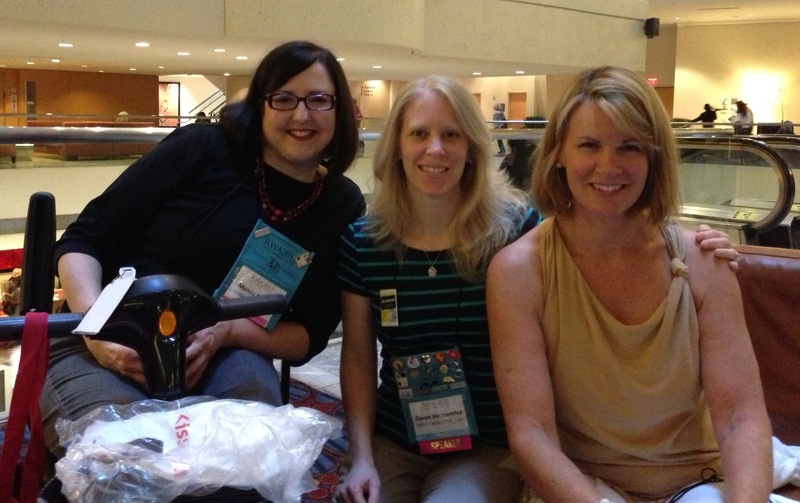 Hanging with my Kiss & Thrill blog sisters, Manda Collins (L) and Sarah Andre (R), in Atlanta. 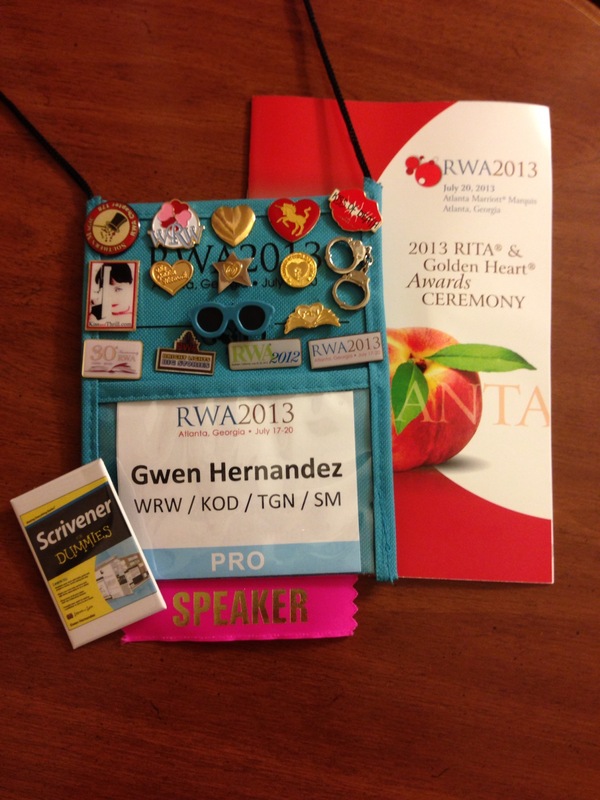 Thanks for sharing your experience at the RWA conference! I’m so disappointed I couldn’t go, but hey, I’ll try again another year : ) How did your workshop go? I’ll be you generated all kinds of excitement in the epub community. Scrivener is making my life mega easy! Audra: I’m sorry you couldn’t go too. Maybe you can get to a regional conference this year. For me, it’s not the size so much as the company. 🙂 My workshop went really well. I had a great turnout, lots of good questions, and received positive feedback. It was fun to show those who’d been in the formatting workshop how they could skip all the steps required to generate a MOBI file if they used Scrivener. 🙂 Glad to hear you’re finding Scrivener helpful! Glad you had a successful conference. Like your badge! Sorry I missed you at the conference, Gwen. Hope your Scrivener class went well. Me too, Kathy! I saw you from afar on the escalator, but just once. The workshop was a lot of fun. Hope your conference went well! Sorry I missed seeing you, Gwen. Glad to hear you had a good time. Looking foward to your Scrivener class in October and cracking open the book next month. Elke: Sorry I missed you too! It’s funny how I saw some of the same people over and over, and missed others completely. Hope you had fun. See you soon. Hi Gwen! Glad you had a great time. My wife and I were out of town or I have would have been there, for sure. I know I won’t be able to go next year because the conference will be held on the same weekend as my nephew’s wedding! Bummer! Where there many male romance authors there? If not, that would not deter me from going. I was just curious. Since you can’t go next year either, you might consider a regional romance conference. There are some great ones in different parts of the country. Emerald City Writers Conference in Seattle is well thought of, as is the New Jersey Romance Writers conference, and Desert Dreams in Phoenix. I’m sure there are more. Maura: I’m glad we had a chance to hang out too!